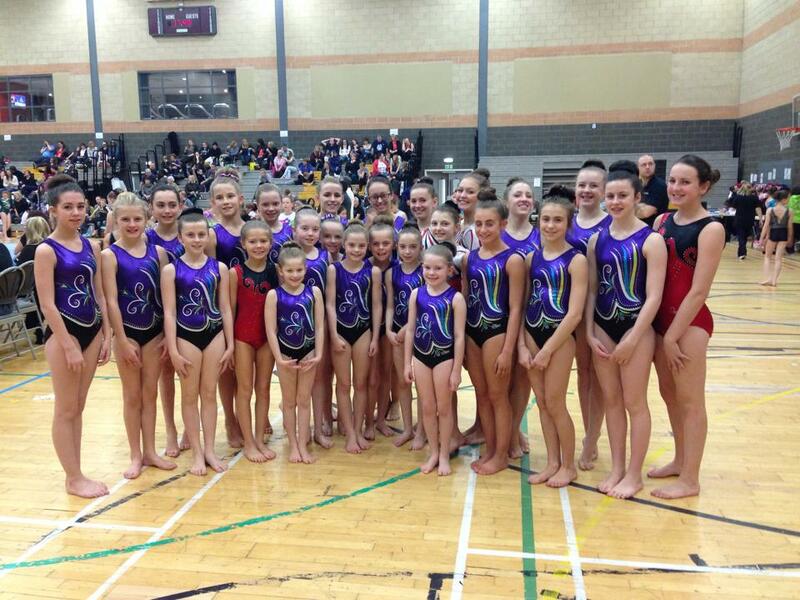 We’re almost at the end of another very successful year for Bishopbriggs Acro! Well done to all of our gymnasts who have been fantastic throughout and a big thank you to all parents/carers who have supported them. We would appreciate any donations for our raffle and home baking stall. Thank you in advance! All profits from the above will be added to our fundraising total. If anyone has any other ideas please get in touch. Our club display this year is being held at Avondale, Donaldson Road, Larkhall, ML9 2SS on Friday 1st and Saturday 2nd December. We’re really looking forward to this event with the full club involved. Please note it’s very important that gymnasts arrive on time for warm up and remember to bring all costumes with them. Last year we had lots of costumes muddled up so please ensure all gymnasts have a bag with them so they can put everything away carefully. Gymnasts should arrive wearing their first costume – this will be their colourful leotard! Girls taking part in the display will have hair in two dutch plaits. If you can do this for arrival that would be great. If not we have plenty of helpers that can do this but please do bring a brush and two small bobbles. We will be putting glitter on gymnasts hair and faces – if any gymnast is not allowed or allergic please let a coach know. Doors will be open to spectators 30 minutes prior to the display commencing. Please note that no seats will be reserved. You can order your display DVD now! We have hired a recommended company who have experience of recording gymnastics displays. DVDs are only £15.00 and will be a great memory to keep forever! Please ensure your order in made before the display. Thank you. Our Christmas hamper raffle is ongoing! Tickets are only £1.00 per strip and all money raised will be used to buy more prizes and treats for our Christmas party. All gymnasts will get lots of prizes and sweeties – team games and fun for everyone. Please remember the Christmas party is for everyone regardless of normal training session. 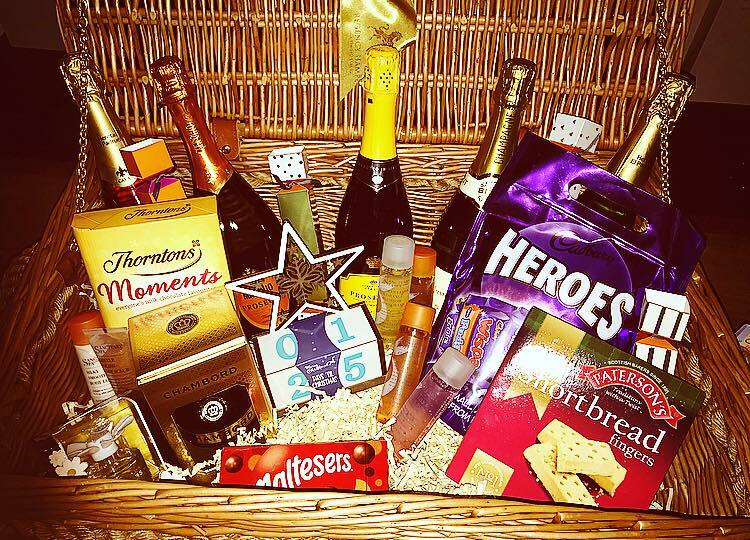 Our Christmas hamper is fantastic with lots of treats – wine, prosecco, chocolate etc. etc. The raffle will be drawn at our display. Don’t miss out! Please enjoy your break over Christmas! This year our coaches have made lots of progress which we’re very proud of. Emma Owen and Jane McLetchie both passed UKCC L2 Acro. This is a difficult exam with complex skills involved. Our coaches worked hard in the gym beforehand and have continued to do so. Holly Mardle and Fiona Glen passed UKCC L1 Acro. Again both coaches worked hard in the gym practicing their handling skills and improving their confidence. Stuart Langan and Clare Lavelle passed UKCC L3 modules 1 & 2 Tumble. Another difficult exam supporting difficult tumble skills such as double tuck somersaults! Heather Mardle attended the UKCC L3 Acro modules and is currently awaiting her exam. She is now using her knowledge and practicing handling skills for her upcoming exam. Claire McLauchlan and Emma Owen both passed their revalidation for Acro Judging. Another difficult exam with lots of prior revision required. Finally, both Heather Mardle and Holly Kelly attended UKCC L1 Tumble and are awaiting their exam. Both are continuing to work hard in the gym and looking forward to their exam. Well done to all the coaches and a big thank you to all the gymnasts that helped them! Please remember that club updates will be mainly made via Facebook and the club website. With over 100 members we struggle to have letters for every update. You can follow the website and all posts will then be emailed directly to you! Any additional dates will be added to the ‘Dates for your Diary’ section of our website. Please note that entry fees will be due not long after we return in January – we will try to give you as much notice as possible. We will have red, blue, black and white T-shirts however, we only have a few in stock to see how popular they are and we will order more after Christmas if required! A great Christmas present for our gymnasts. We can’t reserve any T-shirts before the display, they will be sold on a first come first served basis. Thank you! Follow us to keep up to date with our amazing gymnasts! We’re have a very busy year with competitions, displays, extra training, rehearsals etc. so a big thank you to all parents/carers for ensuring our gymnasts got to all of these. Without your commitment we wouldn’t be where we are! We’ll be very busy when we return after Christmas with the lots of competitions as soon as we return so lots of rest over the holidays please! We have a lot going on at the moment so thought we’d remind everyone! If anyone has any questions regarding the below, please speak to a coach at beginning of training. We are still waiting for some costume payments which are now very overdue. We would appreciate if all remaining payments could be made as soon as possible. If payment hasn’t been made then gymnasts will not receive the costumes. Our full dress rehearsal is taking place at Avondale on Sunday 19th November 13:00 – 15:30. All gymnasts taking part in the display should attend the session. There will be no training at The Leisuredrome on this date. The rehearsal is being held in the same location as the displays – Avondale, Donaldson Road, Larkhall, ML9 2SS. Please ensure gymnasts are on time as we have lots of work to do. Also, please remember we won’t be stopping for lunch although we will have lots of water breaks. We have PSB photography attending our display on Friday night and a videographer on the Saturday. Photos can be bought directly from PSB online after the display and DVDs can be ordered via the club for only £15.00. Orders cannot be accepted without payment! Training has been cancelled on Sunday 3rd December to give everyone a well deserved rest after our display! Again, we really appreciate your attendance and commitment! We still need your votes for the Aviva Community Funding. The process only takes 2 minutes to complete. Please share with friends and family – we need as many votes as possible! Thank you to everyone that has already voted, fingers crossed! Please ensure that you have complete the online insurance process with British Gymnastics. Even if you’ve paid your insurance fee to the club you’re not insured until this has been completed. 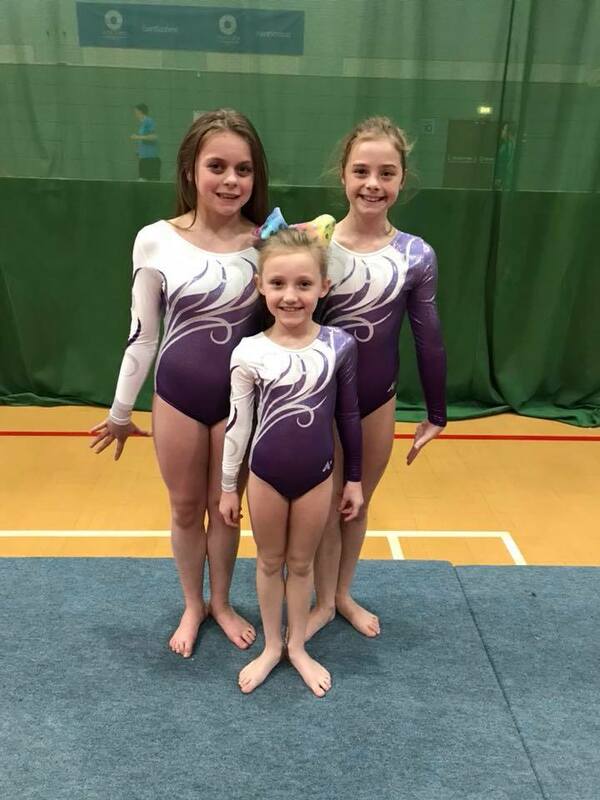 The final date for gymnasts to be insured is Friday 17th November. After this date if gymnasts arrive at training and are not insured we will have to ask them to sit at the side and watch. We don’t want this to happen however, safety must be a priority. Thank you! Raffle tickets are now on sale for our Christmas hamper! The winner will be announced at our display on Saturday 2nd December. Tickets are only £1.00 per strip and all money raised will be used to buy tickets for our Christmas party. Thank you! This year our Christmas Party will be in Meadowburn primary school on Saturday 16th December 09:00 -11:30. All gymnasts can attend regardless of normal training sessions. As always this will be a fun filled event with lots of games and prizes. Gymnasts should wear normal gymnastics attire as lots of the games are gymnastics based. We can’t wait to see you all then! 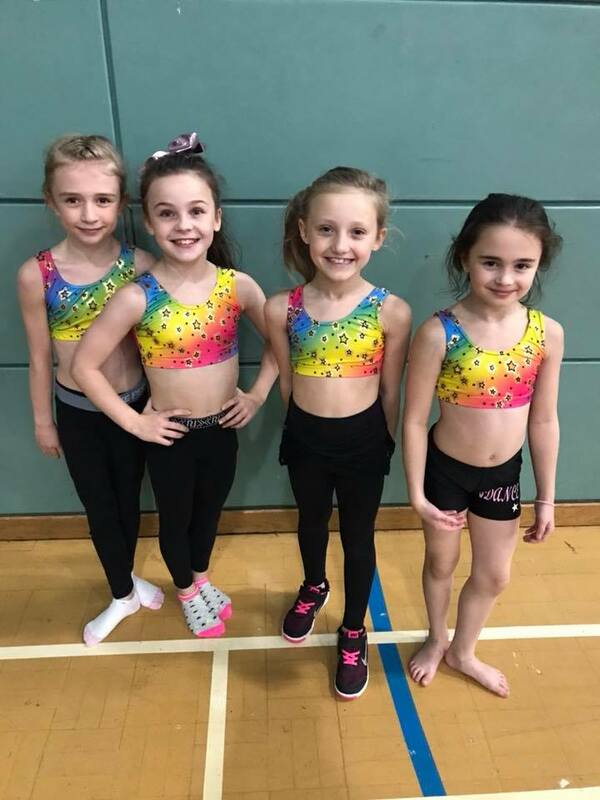 After the full display rehearsal at Avondale on Sunday 19th November all Middlesbrough gymnasts will train 15:30 – 17:00. This will again be a session focused on routines so should be full partnerships only. Can all gymnasts please remember competition leotards and plenty of water! 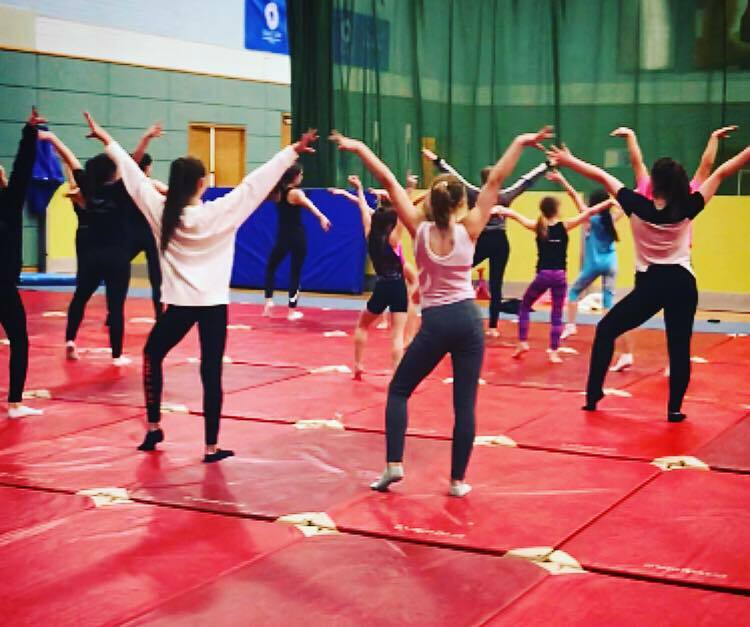 For gymnasts travelling with the club we will be meeting at The Leisuredrome on Friday 24th November @ 16:30. Please ensure you arrive on time so we can stick to our planned schedule. Thank you!